"Sip Coffee and Paint Studio"
CLICK HERE TO PLAY IN THE PAINT WITH US! Terry and Steve DeWitt have been involved in Art their whole lives! 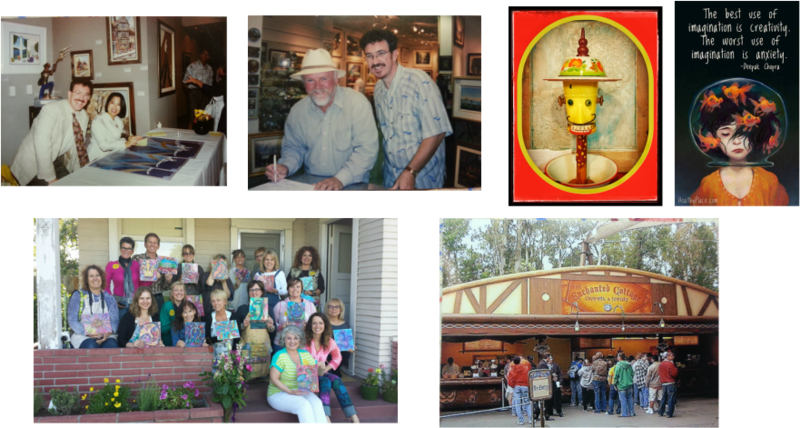 Steve was an Art Gallery Director for 20 years at one of the Largest Art Galleries in Orange County Ca.After leaving the Art Gallery, Steve decided he would like to be a Decorative Painter. Thankfully, living in Orange County gave him the opportunity to attend some of the Top Decorative Art Schools in the Nation. Taking numerous classes; from Plaster to Cabinet Finishes, he was able to bring incredible finishes to homes in Newport Beach, Capo Beach, Doheny Beach, Pasadena and his favorite place in California,,, Disneyland!!! Steve is a Certified Instructor for Modern Masters Platinum Line of Plasters, Wall and Cabinet Finishes. He was also an Assistant to Laura Brewer One the Top Decorative Painter Instructors in Calif with Studio Primrose. He has taught numerous classes at his Studio/Classroom in Los Ranchos de Albuquerque..
﻿Terry is the mother of 5 incredible people! She is "GiGi" to 11 kiddos! Her passion is teaching children about art! Birthday paint parties or Art Camp your child will have an experience they will always remember and a one of a kind Canvas that they created! Terry has an extensive background in Interior Design, Color Theory and Faux Finishes. She is a ﻿"Certified Creative Coach" through the"Creatively Fit " program. Her "Paint Your Power" classes help guide you to "Live your Life More Artfully". Right Brain training and painting can help you to become more Creative and have an Artistic outlook on life... contact her about upcoming classes.